The Hebrew word for “ladder”—sulam—is comprised of three Hebrew letters totaling 130: samach equaling 60; lamed equaling 30; and mem equaling 40. This is the same numerical value as that of the word Sinai: samach equaling 60; yud equaling 10; nun equaling 50; and yud equaling 10. This implies that the peak or ultimate experience of prayer is mystical union with Hashem, such the Jewish people achieved at Mt. Sinai. If the word sulam is spelled with an additional letter vav (equaling 6) its numerical value is 136, which is the same as kol meaning “voice.” This suggests that the means of travel on the ladder of prayer is through the vocalization of our prayers. We need to include all levels of our being on this inner journey of prayer, most importantly our humanness, which is distinguished by our ability to speak, an ability not shared by any other creatures. 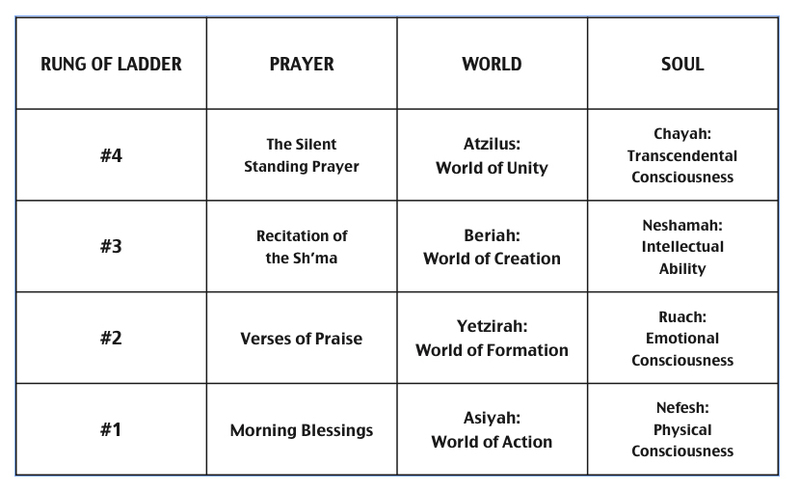 The Midrash Tanchuma says that there were four steps to Yaakov’s ladder, and the Zohar teaches that these four rugs parallel the four main stages of morning prayer, beginning with earthly reality and slowly moving upward and inward to a higher, deeper level of connection and unity with Hashem. At the outset of prayer, we begin by standing on the first rung, and through the course of the prayer service, we climb the ladder toward spiritual perfection and elevation. 1)	Morning Blessings (Birchas Hashchar) which reflect our dawn of our awareness. 2)	Verses of Praise (Pesukei DeZimrah) which cut away any negativity and awaken our emotions. 3)	Reading of the Shema (Kerias Shema) which internalizes our emotions. 4)	The Silent Standing Prayer (Amidah also known as the Shemonei Esrei) which is a deep encounter with the Divine in a quite space of union, ultimately reaching a place of oneness. 4)	the world of unity (atzilus) and the soul level of transcendental consciousness (chayah) which is reflected as our inner most deepest will and desire. As we climb the four levels of prayer upward and inward, we come more in touch with our deeper levels of soul, and they become our internal reality.